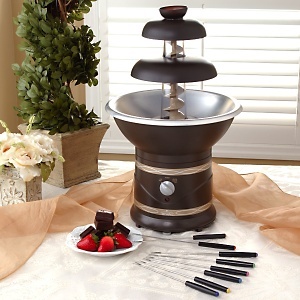 Turn any occasion into an event with the Rival Chocolate Fountain! Imagine entertaining and delighting your guests with the sweet aroma of warm chocolate and the visual centerpiece of a decadent, cascading chocolate waterfall. The Rival Chocolate Fountain holds 3-5 pounds of chocolate and best of all uses any brand of chocolate. Let your guests indulge themselves by dipping fruits-strawberries, bananas, cherries, cookies, cakes, nuts, pretzels and even marshmallows, whatever their taste! The Rival Chocolate Fountain is easy to assemble, as well as disassemble and clean. All parts, except for the base, are removable and dishwasher safe. Next time you entertain, let the Rival Chocolate Fountain do the entertaining for you!